7 ways to win at e-commerce this holiday season. The holiday season may seem far away when you’re focused on the day-to-day work that comes with being in a small business, but now’s actually the perfect time to plan an amazing holiday shopping experience for your customers. From social media selling strategies to easy financing options, tap into these seven online selling tips to help increase your holiday sales. 1. 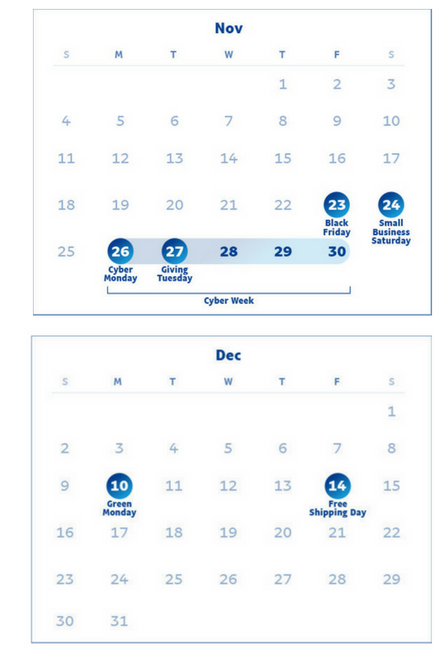 Make sure new shopping holidays are on your radar. 2. Promote easy customer financing. When shoppers are stretching their budgets during the holiday season, financing options are appealing. In fact, 69% of consumers are more likely to use online purchase financing during the holiday season.1 With PayPal Credit2 for example, customers can buy what they want now and pay over time – all while you get paid up front, with no risk. Personalization lets you take a great in-person shopping experience—you know, one where the sales associate remembers your name and helps you find exactly what you’re looking for—and recreate it online. Those online experiences are driven by data, so make sure your platform’s equipped to collect it. Start with something as simple as gathering your customer’s name and email address. Encourage website visitors to share that info with you by offering an introductory offer—a free shipping code or 10% off their first order, for example. Once data is captured, it can be used to personalize all elements of the online shopping experience, from welcoming a customer to your website, to reminding her about an abandoned cart, to sending a thank you email and inquiring about her satisfaction with a product. 4. Sell directly on social media platforms. Social media accounts for more than 30% of the time that consumers spend online.4 Facebook Shops, Shopping on Instagram, and Buyable Pins let you list and sell products directly in user feeds, allowing consumers to make a purchase without having to visit your website. Plus, customers often share the products they browsed or bought—a marketing win for any brand selling online. Instead of listing your products on every social platform and hoping for the best, get strategic. Determine where your most engaged audience is and focus your attention there by creating a shopping experience that pairs perfectly with the platform. For example, if you’ve got gorgeous product photography and a growing Instagram audience, start with Instagram. If customer service is a big part of your business, consider a Facebook Shop, where you can integrate Messenger for top-notch customer support. 5. 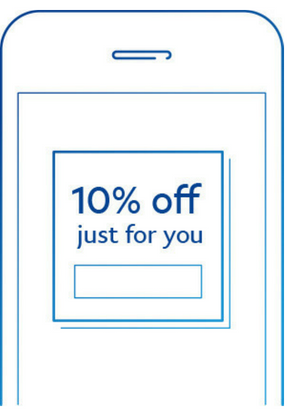 Create mobile-optimized shopping experiences. 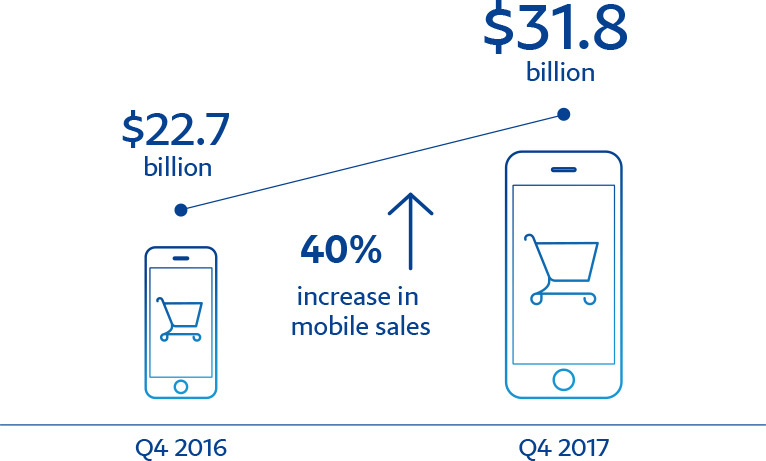 With mobile taking on an increasingly larger piece of the e-commerce pie, you may even want to optimize for mobile before desktop. And checkout is one area you want to pay close attention to. Make sure you’re making the checkout process as convenient as possible for shoppers, like letting shoppers bypass re-entering their payment and shipping information every time they shop. Dynamic buttons, like the PayPal Checkout button, can also help you streamline the checkout process by letting shoppers make a purchase directly from a product page. 6. Offer fast, free shipping. These are three words that can make or break a shopper’s decision to go through with a purchase online. Just look at the numbers: 47% of consumers will back out of a purchase if free shipping isn’t offered, while 51% will add additional items to an order to meet a free shipping minimum.7 It’s no surprise that merchants are meeting these demands by shipping more online purchases for free. 7. Don’t ignore virtual assistants and voice search. In short, predict what questions shoppers will be asking and use them to craft your content and meta data, the information you enter on the back end of your website to help search engines (and consumers) find your pages quickly and easily. The best part about tapping into these seven e-commerce trends: The marketing tactics and technology upgrades you employ ahead of the 2018 holiday shopping season will also help you hit the ground running in 2019. Think of the investment you’re making now as a holiday gift to the business you’re growing. 3 Based on PayPal's analysis of internal data across 700 middle market merchants against a similar control population between January 2013 and March 2018. 4 Source: GlobalWebIndex. Social Media Captures Over 30% of Online Time, September 2017. 5 Source: A third of Americans live in a household with three or more smartphones. Pew Research Center, Washington, D.C. (May 25, 2017). 6 Source: comScore. State of the U.S. Online Retail Economy, Q1 2018. 7 Source: National Retail Federation. Rising demand for fast and free shipping. 4 must-have strategies to manage cyber fraud. Today’s digital transformation allows us to keep in touch and shop anywhere. It also creates opportunities for cyber fraud. While there’s no way to stop it, security experts advise a four-step strategy to minimize negative impacts.